Handle Designed for Overload Protection—Handle bends to warn of hazardous condition and prevent dangerous overload. Hooks with Hook Latches—360° swiveling hooks equipped with latches for positive load engagement. Tested to 125% of Capacity. Lightweight and Rugged—Special cast aluminum alloy housings. Heavy Duty Cable—Utilizes preformed and galvanized 7 x 19 (133 strand) extra flexible aircraft cable. Corrosion Resistant—All stainless steel springs and shafts. Reduced Wear—All rotating shafts are mounted on bronze bushings. Self-storing Cable Drum—Provides compact operation. Fast Cable Take-up—Winding wheel provided for quick take-up or positioning of cable. Easy Load Positioning—Utilizes a double interlocking pawl system for precise load adjustment. Positive Load Holding in All Environments—Provided by double interlocking pawl mechanism. Open Construction—Allows for easy cleaning and inspection. All models are available with Bullard-type hooks. 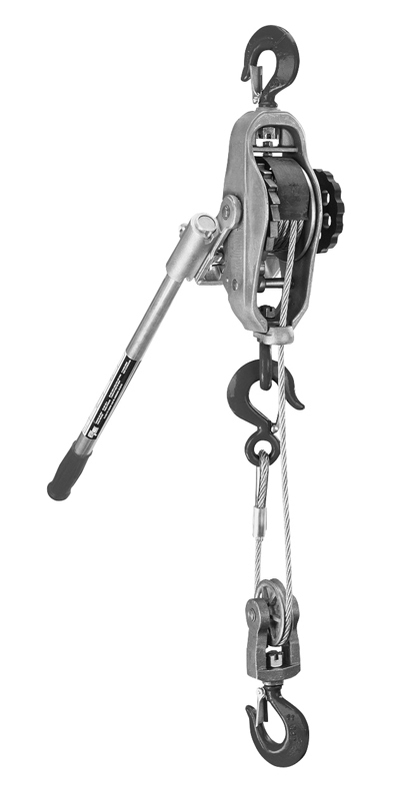 CM430CDPA equipped with oversized slip hooks— ideal for opening and closing boxcar doors. Overloading and improper use can result in injury. Do not use to lift people or loads over people. use only alloy chain for overhead lifting.